The soil residing bacterium Agrobacterium tumefaciens causes crown gall. Agrobacterium tumefaciens modifies the genome of host plants by introducing some of its bacterial genes into the plant's chromosomes. However, plant breeders also use the crown gall bacterium as a tool in the process of genetic engineering. Only a few plant species sustain tumors of a noticeable size, but there are over 650 species susceptible to infection. It is most common on brambles, woody vines (such as Euonymus), fruit and nut trees as well as willow and other hardwood shade tree. Conifers are generally resistant. Crown galls are tumors, which often arise on the stem where it meets the soil (root crown), but they also develop on roots and branches. Infected plant cells contain bacterial genes (actually a plasmid) that replace some of the normal plant cell's genes. At first swellings on roots and stems are small, light-colored and round. They often enlarge and become more numerous during succeeding periods of plant development. Crown galls encircle or extend along infected stems and roots due to excessive division and development of infected cells. When crown galls are numerous, plant leaves are yellowed and smaller than normal. Moreover, the impact of environmental stresses such as heat, water shortage and cold damage may be more severe. Agrobacterium tumefaciens manages to survive in the rhizosphere on materials that leak from roots. It infects wounded host plant stems and roots. Actually, sugars and phenolic compounds emitted after wounding attract the motile crown gall bacteria. The bacterium infects stems and roots wounded by insect and nematode feeding as well as cultivation damage, root pruning and transplanting activities. The bacterium primarily affects the plant by attaching to the cell walls and inserting a plasmid with genes that code for production of plant growth-regulating hormones. The bacterial plasmid genes induce the production of higher than normal concentrations of plant hormones (auxins and cytokinins) that favor bacterial growth at the expense of the plant. Thus, the crown gall genes induce the plant cells to grow more profusely and to a larger size than they would normally grow, thereby creating galls. 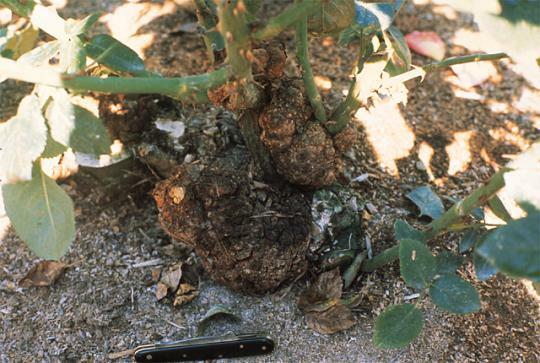 Agrobacterium tumefaciens returns to the soil as the galls decompose. 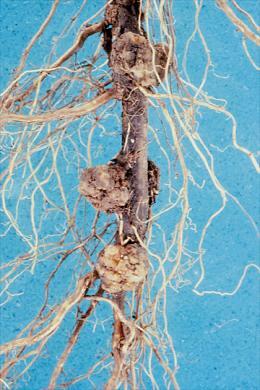 Avoid introducing Agrobacterium tumefaciens to a site by inspecting the roots and stems of new plants for galls. The bacterium induces a genetic change distributed throughout infected plants. Thus, removal of galls from these plants is of little benefit other than to improve plant appearance. In soil infested with Agrobacterium tumefaciens, grow crown gall resistant plants. Some of the resistant trees include: beech, ginkgo, golden-rain tree, holly, hornbeam, little-leaf linden, magnolia, serviceberry, tuliptree, yellowwood, and zelkova as well as the conifers. Biologically control crown gall in nursery settings by soaking germinated seeds or dipping seedlings and rootstocks in a suspension of Agrobacterium radiobacter strain K-1026. The antagonistic bacterium inhibits the colonization of the roots by the crown gall bacterium. Photos: A. K. Hagan and L. W. Moore, Diseases of Woody Ornamentals and Trees. APS Press.